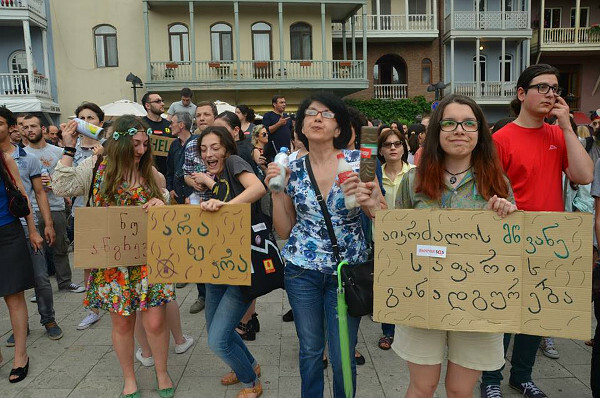 TBILISI, DFWatch–Tbilisians demonstrated Saturday against several construction projects which in their opinion will damage the authenticity of the city, especially in the old districts. The list of protest issues included destroying the city’s green cover, and destroying historical places by constructing multi-floor buildings. Organizers from Tiflis Hamkari want an urban development policy for Tbilisi to avoid decisions that are ‘anti-social’ and argue that specialists and the general public should be involved in the decision-making process. The demonstration then moved toward the old part of the capital in Abanotubani, where several local bands and singers performed. There was also an exhibition showing the buildings which are under threat of being damaged or destroyed by the new projects. Among the most criticized projects being planned in Tbilisi are Panorama Tbilisi and the recently approved project on Mirza Shafi Street right behind the Abanotubani district.